Welcome back to another week of Fantasy basketball. We’re now into late-January, meaning we’re less than three weeks from the trade deadline, so be sure to keep your ears to the ground and be prepared to pounce on players that gain value as a result of a deal. This week, the Lakers found a way to win in Indy despite the worst FT shooting performance in NBA history; Charlotte, which is weighed down by some bad contracts, is open to dealing star PG Kemba Walker; and Giannis Antetokounmpo (knee) is expected to miss a couple of games, so Thon Maker could be worth a flier in DFS formats. 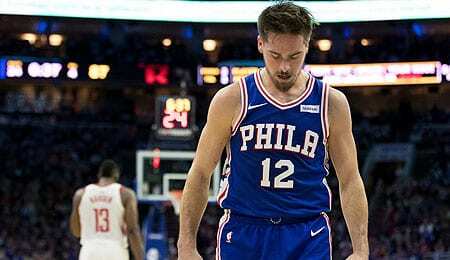 T.J. McConnell, PG, Philadelphia 76ers (ESPN: 13.2 per cent; CBS: 27 per cent): With J.J. Redick out for the next couple of weeks, McConnell will be well worth owning. McConnell is already looking good, having scored double figures in three straight games, including a career-high 18 points on Monday. His PT is up over the last couple of weeks and figures to rise more, and he’s seen a corresponding boost in touches. McConnell actually isn’t shooting as well as he did in December, but he’s yet to have a month in which he’s been below 50 per cent from the field, which is very impressive for a guard. In fact, his 53.5 per cent field goal rate this season would lead all backcourt players if he qualified. McConnell will not get the starting assignment Saturday, but don’t let that dissuade you from picking him up — especially given his capability of filling the stat sheet. The Pennsylvania native was known as a relentless defensive player in college, and that skill has helped him earn PT in the NBA. It doesn’t hurt that McConnell won’t back down when challenged (see video below). JaMychal Green, PF/C, Memphis Grizzlies (ESPN: 12.2 per cent; CBS: 46 per cent): Green has really stepped up lately, recording his first four double-doubles of the season over a 13-game stretch before Friday. If not for some poor shooting (3-for-9), he likely would have pulled the trick again on Friday as he did get 10 boards (and a block). Green’s PT is up a smidge lately, and if he hadn’t been in a shooting slump, his numbers would be even more impressive. Overall this month, he’s actually seeing less action, but has been shooting better (recent performances notwithstanding). Green’s touches are up this season, but he hasn’t been getting to the line as much. We’d like to see that change for him to become a true Fantasy force, but he’s trending in the right direction. Note that Green will have his hands full Saturday trying to shut down Anthony Davis, so may not make for a great play in this game, but we really like his second half outlook. George Hill, PG, Sacramento Kings (ESPN: 24.4 per cent; CBS: 50 per cent): Hill has been maddening to own lately. He scored 20 or more points in two of the previous four games, then took a DNP-CD on Friday. Really?!? However, the Kings are rumoured to be interested in peddling Hill, with Cleveland mentioned as a possible landing spot. There’s a chance he starts with the Cavs (at either guard spot) or comes off the bench as the sixth man, but it seems now that virtually anywhere he moves he’ll have more value, so makes for a good stash. Why the Kings ever signed Hill in the first place is a mystery, but hey, there’s a reason they’ve sucked for so long now, right? Toronto PG Kyle Lowry finally looked like himself Friday, in his third game back since his injury. He scored 24 points, including nine in the pivotal fourth quarter, as the Raps beat San Antonio. Lowry was 3-for-16 in his return, 5-for-14 in the second game, and then 8-for-16 Friday. He’s back, baby. It’s time to give some Fantasy love to Memphis SF Dillon Brooks. He’s had three straight games of at least 17 points, including a career-best 22 on Friday. Brooks’ three-point shooting of late has been off the charts. LaMarcus Aldridge hasn’t been getting to the line quite as often as usual lately, but he’s lights out when he does get fouled, going 12-for-13 over the last two games. His shooting touch from the field has also been great lately, except for Friday, when he was just 2-for-11 in the first half, and not much better in the second half (4-for-14) for his worst shooting performance all season. On the plus side, he tied a season high with 14 boards. Zach Randolph didn’t exactly put on a show in his return to Memphis on Friday. He got the love with a video tribute and standing ovation, but got into foul trouble that limited him to 19 minutes. Z-Bo managed a mere four points and six boards while turning it over four times. His touches are down lately, so you may want to sit him until he returns to form. The former Southeastern Conference Player of the Year, Portis is starting to make noise as a rookie trying to earn PT on a deep Bulls’ squad. His minutes remain inconsistent, so he’s likely just a deep league/dynasty option right now, but we saw his potential last Saturday when he put up 20 points, 11 boards and two steals in just 23 minutes. Barnes is a starter on a good team who is averaging 30 minutes. He’s a safe bet to not hurt you and definitely isn’t going to kill you. Barnes will hit a three or two per game making him if not a flashy pick up, a solid one.